Once upon a time, in a small grocery shop, there lived many mice. They were happily eating all the delicious food items in that shop. The shop owner was worried about the problems caused by all these mice. So he was thinking about some good solution to chase them away. So, then on one day he brought a big fat cat to his shop. The big cat started killing many mice everyday. Now the mice were all worried about the cat. So they all had a meeting to talk about how to get rid of these cats. The oldest mouse, said "Dear friends, we cannot do anything against such a big cat. So I feel we should leave this place and find a safe place to live"
The younger mice in the group laughed at these. They called the old mouse as coward. One of those mice said, "We should not run away like this, if we could tie a bell around his neck, then every time the cat walks, we can hear the sound of bell and hide in a safe place"
All the mice were excited about this idea. They started to dance with joy to celebrate the plan. As all these were happening, the old mouse once again came in front of all those mice and asked, "Dear friends, before enjoying please decide who is that brave one to go and tie the bell around that big fat's neck?" All the young mice stopped dancing. No one came forward to accept the challenge. 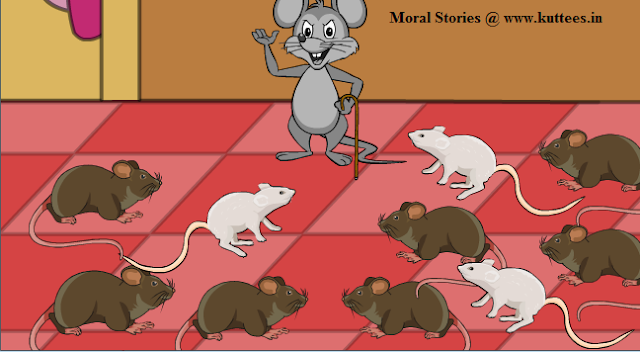 They all realized their foolishness and agreed to what the old mouse had said.